The Four Seasons Singapore is consistently rated as one of the great hotels of the world. Opened in 1994 it has distinguished itself as being a truly elegant and service-focused property. However it was ready for a refresh and in a city as competitive as Singapore this meant that they had to raise the bar quite a bit. We’re happy to report that they have. 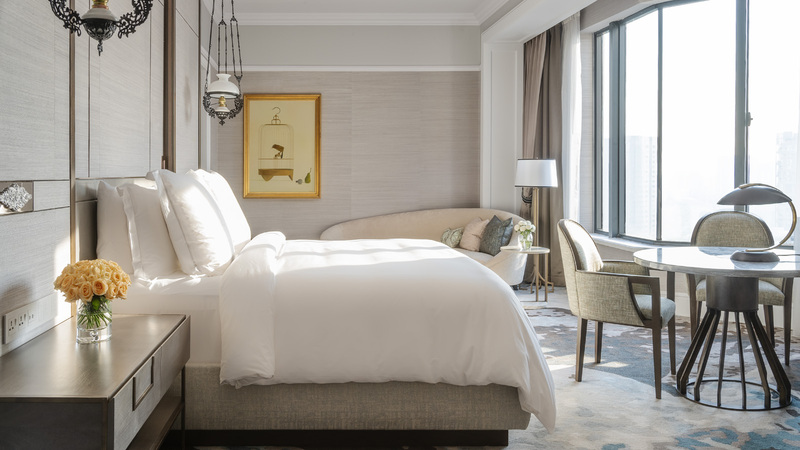 Renovations began in early July 2018, led by the interior designers Hirsch Bedner Associates, who led the renovations of the Jiang-Nan Chun restaurant in 2016 and the opening of the Hotel in 1994. So the new rooms and suites retain much of the original hotel’s charm and elegance but feel much more modern. 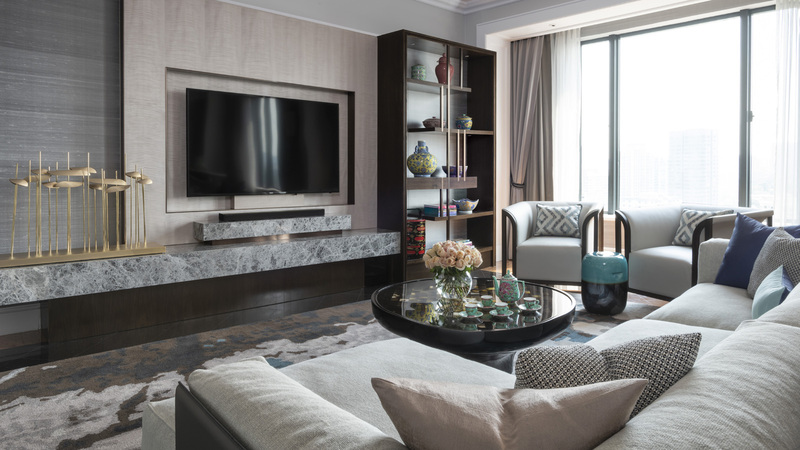 The property features 4 types of suites, the Royal Suite, Governor Suite, Ambassador Suite and the Presidential Suite which all are designed around Singaporean motifs. We loved the Ambassador Suite which blends an understated charm with quiet and relaxing colours. Who needs to explore Singapore when you have a suite this enjoyable? At nearly 1,800 square feet with generous floor to ceiling windows, the Ambassador Suite’s design is based upon local Peranakan culture. Peranakan culture is a unique heritage that blossomed from the 15th Century as a result of inter-marriages between the local Straits community with non-Straits descendants, when Singapore was a major trading port. This cultivated a beautiful cross-cultural appreciation in Singapore, evident through distinctive art styles, fashion, language and recipes. It’s part of what makes Singapore special to this day. 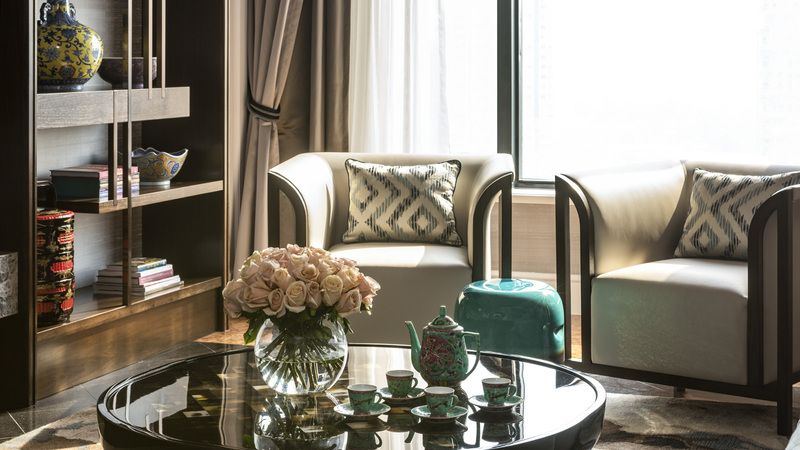 Accented with existing Straits Chinese elements through chic modern furniture in a turquoise, grey and dusty rose scheme, the suite is located on the 19th floor and exudes a unique grace and charm. The pottery on display is called kamchen pottery and its intricate design blends with suite’s calm decor. As a feature we love the table and chairs in the bedroom overlooking the city view. It’s a great place to have coffee in the morning and prepare for the day ahead. The Four Seasons Singapore has 255 guest rooms including the suites. The dining options on property include the One Michelin-Starred Jiang-Nan Chun, renovated in 2016 and led by Chinese Executive Chef Tim Lam, One-Ninety Restaurant which features an open dining concept, complete with a theatre kitchen and chef’s table, as well as the One-Ninety Bar with a great alfresco Terraza. We’re not sure with a suite like this and all of the F&B options you’ll ever need to leave. We liked to hunker down and relax.